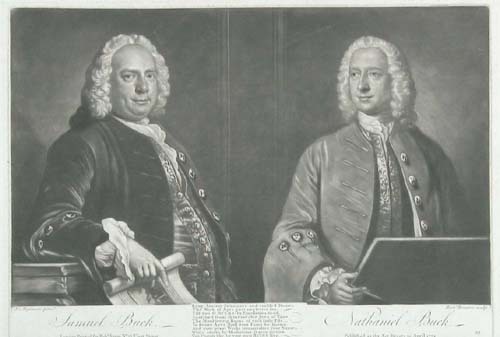 Samuel Buck - Nathaniel Buck. Engraved by Richard Houston after Joseph Highmore, published by Robert Sayer, 1774. The Buck brothers are famous for their series of eighty prospect views of cities and towns in England and Wales, in many cases the first views of the places depicted, and four hundred views of castles, monasteries and ruins, smaller in size. Nathaniel is holding a pencil and a drawing pad. Judging by the number of prints they produced in eighteen years, one supposes the equipment can hardly have left his side. Samuel is holding one of the small prints. The print is a typical example of the tones achieved with mezzotint. Samuel's coat is definitely velvet, rich in texture, with a glowing sheen, and his waistcoat is satin. The buttons on his coat and the table on which he is leaning are highly polished. Backgrounds are usually more interesting than this, but it shows how a good engraver could gradually alter the shading of a flat surface. The even blackness of the pad in Nathaniel's hand shows the texture that the plate would print before the engraver started work on the image, putting in the lighter tones.